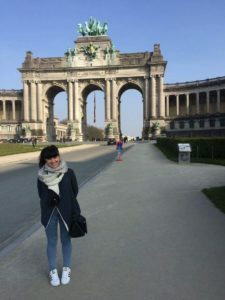 Laura Garcia Rueda is a very energic and positive girl from AEGEE-A Coruña, she has a lot of experience on the local level ( she is currently the secretary of her local) and she has already worked with SUCT becaming a SUpporter for it this past year. The AEGEEan : Can you introduce yourself for those who don’t know you? 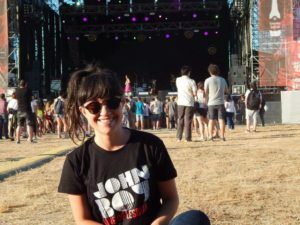 Laura : I’m Laura from A Coruña, a beautiful city in the northwest of Spain. I studied oceanography and now I’m going to start my masters’ in environmental management. I really love music: Arctic Monkeys, Oasis, Blur, The Beatles… Brit pop and alternative music in general (also Spanish music). I like to go to music festivals and enjoy the beauty of music having a good time with friends. I’m a cinema lover, a supporter of my Deportivo de La Coruña, always with a smile in my face, positive, and someone who never gives up. Contact me if you are interested to know more about me. What valuable lessons did studying the ocean give you, that you would apply in your work for SUCT? After several years studying, I think I have acquired a working methodology that is very necessary when you have to get involved in a project like this. Not only the habit of studying and working that the bachelors’ can give you, but it’s the amount of teamwork that I have done which has prepared me to know how to work on a team. Taking care of the ocean, of the animals, the samples to make measurements is like taking care of all our organisers, you have to be concentrated, be very careful in order to have the best response from them. Why did you apply for SUCT? Especially, can you tell us why did you decide to run as Project Manager? I’ve applied for SUCT because for me the SU project has a lot of potential to make the association more known, get and motivate members. A unique experience which brings the opportunity to get out of your comfort zone and, finally, develop more skills once you’re involved in AEGEE. I have chosen project manager because I consider that my experience (being main organiser, helper and participant of different SUs) has gave me a clear understanding of the project. Furthermore, after being participant in some training events (such as Develop Yourself 3 and SUPS in Skopje, among others), I have gained the necessary skills to be a good leader, be able to work within a team and manage it and also to solve conflicts. In your programme you said that you want to improve the collaboration between SUCT and AEGEE-Academy, in which way? As main organiser of a SU and having contact with many experienced members from my local and others, I could learn that there is a lack of good trainers and, for this reason, trainings in the Summer Universities. So, I would like to keep more in touch with them and, as much as we can, try to have some agreements to motivate more locals to ask for trainers and, also, more trainers to attend SUs and deliver sessions. We can also work together in the compulsory content for the SUs to make it more attractive for everyone and be able to give content and fun to the participants and organisers. If we are able to give that, the result will be that more people will want to join AEGEE after their SU. How do you envision the celebrations for the 30th anniversary of SU? Not every day is the 30th aniversary of someone, so why not celebrate it? I think is a good opportunity to make a great tribute to the Summer University Project and we all know that the current SUCT is preparing something special, so wait a bit and give me the opportunity to surprise you a bit! I can promise that it will be something unforgettable! If you could choose just one big aim to improve SUCT, what would you choose and why? The most important thing that SUCT needs to improve is being closer to the locals and other European bodies, in order to help them in a better way, and have more comunication with the European Bodies in order to have more quality in the Summer Universities. They were improving a lot in this sense but, as main organiser this year, I can say that there is room for more improvement. What are your aims and hopes for SUCT? I hope that we can continue doing a very good job inside SUCT, rather improving it, achieving all the proposals in ours programmes, or at least letting them have a start. Combining the knowledge, experience, motivation and good relation that we will have in our team, I think that we’ll be able to make a huge work, to contribute a lot in this project and to help organising, once again, the summer of the life of hundreds of young people. You said in your application that you want to keep SUpporters and activate them more. Do you have a programme for that? What exactly, and how can they support you? In your opinion, why right now SUpporters are not so active? About SUpporters, I was thinking about some improvents to include in our programme: organise more Skype meetings with them, use the survey to the Network that I also want to implement to make guidelines and useful documents in order to make those task more easy. They can support us in a different ways. Working as a team, sharing tasks, or they could even contribute with their own experience and knowledge, in case they have it. If they won’t have enough yet, the knowledge transfer will be fundamental in order to involve them in our work with more confidence. I think that now they are not very active because they are not enough motivated. We should motivate them more, being more communicative and interactive with them.